Keep your trees healthy and your property safe! For over 55 years, Martin Schmiede has been caring for trees, keeping trees healthy and Union County properties safe. Martin Schmiede, the founder and owner of the SCHMIEDE TREE SERVICE COMPANY INC., emigrated from Europe in 1952. In 1955, he started his business as a tree doctor in Fanwood N.J. The firm began with designing and constructing oriental gardens, swiss rock-gardens, hydro-seeding, transplanting, waterfall-construction, and sunken gardens. It also provided maintenance services for ornamental trees and shrubs. With the arrival of brush-chippers,cherry-pickers, stump-grinders, blowers, and cranes, the company developed into a full- scale Tree and Landscape firm. In 1953, Mr. Schmiede supervised a good portion of the landscape-construction of the Garden State Parkway, from Perth Amboy to Cape May N.J. As a tree expert, he felt privileged to have been so constructive in the development. Additionally, he has worked with lighting, incorporating it into various houses, trees, and gardens. Amongst his projects is the Scotch Plains magnificent 90 foot high PIN_OAK in the Village Green that lights up with 20,000 miniature lights in the winter-holiday season. Mr. Schmiede received the State certified Tree Expert-Diploma from the State Department of Environmental Protection and Economic Development in Trenton N.J. in 1961. He became a frequent guest-speaker as a certified arborist speaking at garden-clubs, Boy Scouts, Kiwians, Rotary clubs, and The Old Guard. 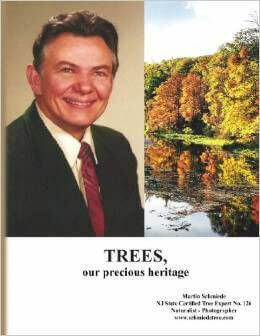 In 2010, he wrote a book, TREES, Our Precious Heritage, dedicated to his wife Lieselotte. It can be found through Amazon or Barnes and Noble. Mr. Schmiede looks back fondly over the 60 years of an achievement that have fulfilled his most profound dreams. For many years Mr. Schmiede personally sprayed the various Rockefeller Center Christmas trees using high-pressure hydraulic equipment with the anti-dessicant wax solution known as "Wilt-proof". Wilt-proof kept the needles on for 2 and 1/2 extra weeks, plus kept them nice and shiny throughout the holiday season. The Schmiede Tree Expert Co. was responsible for maintaining trees and shrubs around Saint Patrick' Cathedral to control insects like the Tussock moth on the Sycamore trees. Martin Schmiede was responsible for the ROOF GARDENS planted by HENRY VAUGHN EAMES. He was tasked with ensuring the plants, shrubs and trees where well anchored and maintained. This was a job that required a great deal of responsibility, since the uprooting of a mature tree could cause devastation and even death to anyone on the street below. Why call Schmiede Tree Service? Our goal is to improve the health of your trees without breaking the bank. Prices vary significantly based upon the treatment option in question and will be identified upon evaluation. Contact Martin to find out more.